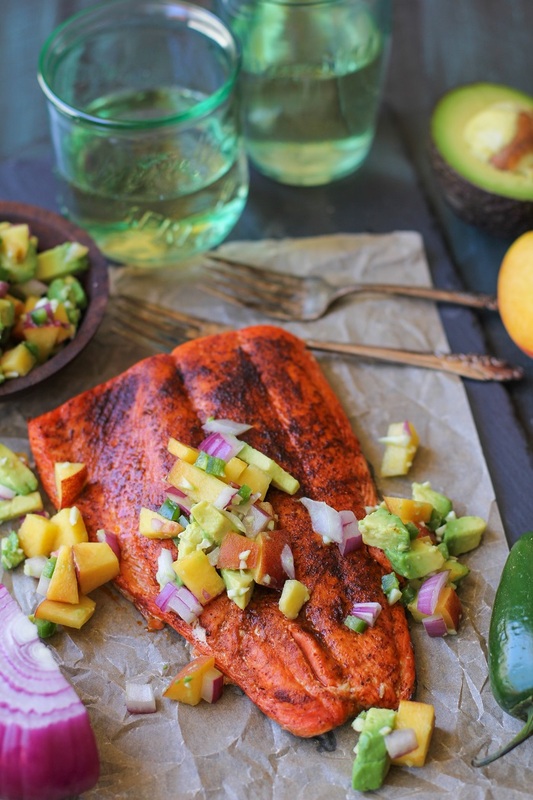 Sockeye salmon with a smoky dry rub broiled to perfection with peach and avocado salsa – a healthy dinner that comes together in less than 30 minutes! What are your plans for the 4th of July? We’re heading up the mountain to Lake Tahoe to visit family, mountain bike, lay on the beach, watch fire works, BBQ, the whole bit. I thought I’d send you off on your holiday weekend with one of my favorite meals (cue broken record): broiled salmon. I love this methodology so much, I’m practically at a loss for words. How else to describe a meal you adore and consume weekly, other than to just say: rad? For those of you who are looking for an easy entree that’s has healthful undertones with crowd-pleasing overtones, you’ve got yourselves a win. Remember a few short weeks ago when I posted The Only Grilled Salmon Recipe You’ll Ever Need? Make the acquaintance of its counterpart using the easy bake oven – you’re looking at a great go-to for oven-roasting salmon! Quick – broiling salmon requires only a few minutes of prep time and 8-12 minutes of cook time. Easy – all you need is some olive oil and spices – no fancy equipment or technique necessary! The Best – Broiling creates a crispy exterior with perfectly moist interior for a superb result. No Fuss – Requires very little post-meal cleanup. For this particular recipe, I used Sockeye salmon, which is famous for its deep red color and distinct flavor. Lower in fat than King Salmon, sockeye is a great choice when looking for a leaner fish. 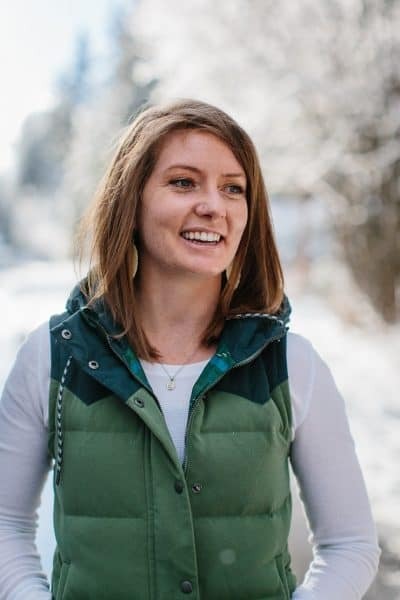 Sockeye is a great source of omega-3 fatty acids and Vitamin D and its season runs from mid-May through August (so it’s in season now, folks!). Copper River Salmon (the fine folks I told you about in this post) sent me the gorgeous sockeye fillet you here – fresh from Cordova, Alaska! It was sustainably sourced by family fishermen, who genuinely care about the life of the fish and the quality of the product they harvest. Such commitment truly shines through in the flavor and texture of the fish! 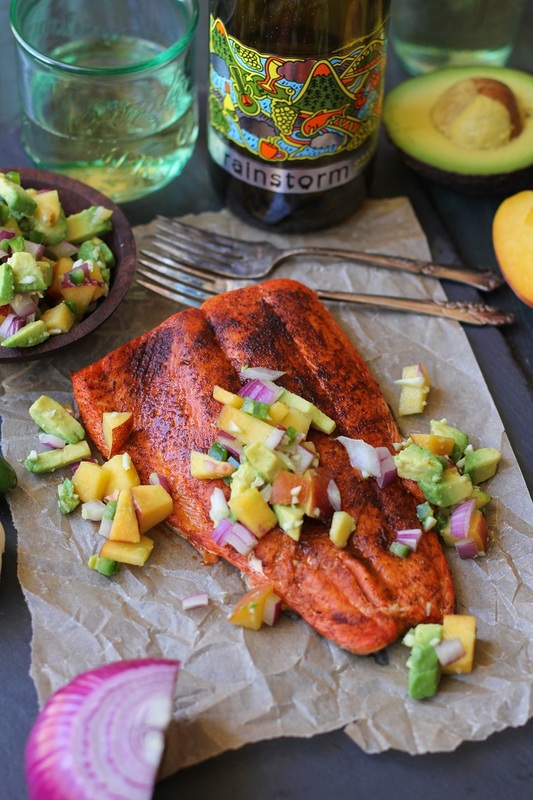 Because summer is for salsa-ing, I whipped up a peach-mango salsa to serve with this salmon. It’s such a simple recipe and kicks your dinner up a notch. You can make this a tropical situation with pineapple or mango, or go salsa-less. I love eating salmon with a crisp glass of white wine, grilled or sauteed veggies, and steamed rice. Toss together all of the ingredients for the peach-avocado salsa. Taste for flavor and add more lime juice and/or sea salt to taste. Refrigerate until ready to use. Place the oven on the high broil setting and move one of the racks to the top rung. In a small bowl, combine all of the seasonings and sea salt and stir well. Place salmon fillet in a casserole dish or on a baking sheet. Drizzle the salmon fillet with olive oil and use your hands to spread it over the full surface of the flesh. Sprinkle the seasoning over the fish. (Note: if you have the time and forethought, marinate the salmon in the dry rub and oil for 1 to 4 hours). Place salmon under the broiler on the top shelf and broil until golden-brown and crispy, about 10 to 12 minutes (note: fillets that are thicker than 1 inch may require more time), or until fish has reached desired doneness. For a rare center, cook 6 to 8 minutes. 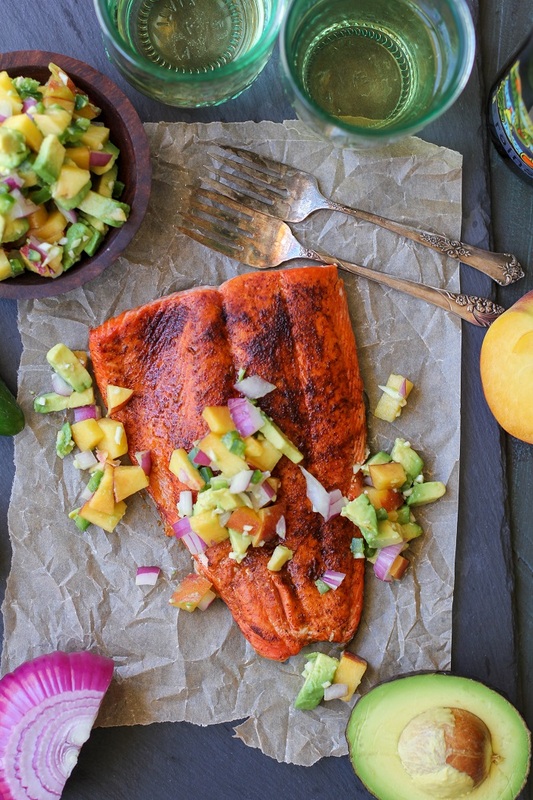 Serve salmon with peach-avocado salsa and choice of side dishes. 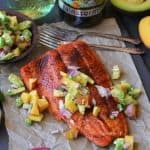 Copper River Salmon supplied the amazing sustainable fresh-caught wild Alaskan salmon fillet in this recipe. All opinions are my own. It sounds like you have an amazing 4th planned! This salmon looks like it needs to make an appearance on my plate soon! Delicious! Heck yes! Salmon for dayz! Have a happy 4th, m’dear! I want this … and I want it now!! 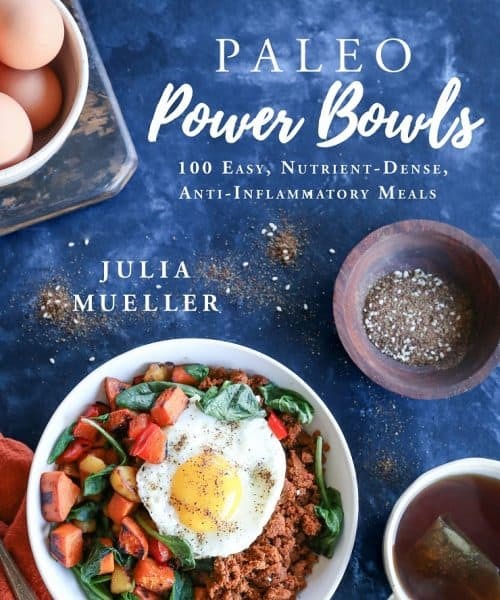 🙂 Absolutely amazing recipe Julia! Okay, that peach salsa is seriously making my mouth water!! YUUUMMM. Definitely will have to try this one soon :). It sounds like you’re going to have an AMAZING 4th! We’re taking it easy and visiting family in Memphis… and I’m drooling over this recipe because OMG SALMON IS SO GOOD. Definitely gonna have to try it soon!